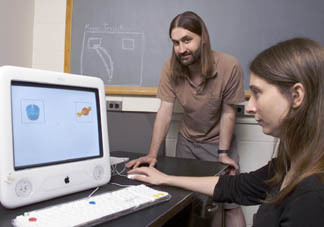 Michael Spivey (pictured) and his collaborators at Cornell did a cute little study, where they tracked the movement of the subject’s mouse as they tried to move it toward a picture on the computer screen corresponding to the word they had just heard. When the two pictures were of items whose lexical representations are “close” (think “candy” vs. “candle”) the mouse darted tentatively toward one before converging on the correct one. As the authors say in the abstract, “competition between partially active lexical representations are revealed in the shape of the movement trajectories”. This seems like a useful thing to do, while hardly qualifying as a breakthrough. In [our new] model, perception and cognition are mathematically described as a continuous trajectory through a high-dimensional mental space; the neural activation patterns flow back and forth to produce nonlinear, self-organized, emergent properties—like a biological organism. Well, gee whiz. Maybe that’s because it is. PS. It does not seem altogether irrelevant that Spivey is apparently the inventor of the Spivey Test, where instead of computers trying to act like humans, humans try to act like computers. This entry was posted on Sunday, January 30th, 2005 at 19:03	and is filed under Uncategorized. You can follow any responses to this entry through the RSS 2.0 feed. You can skip to the end and leave a response. Pinging is currently not allowed.